Microsoft has announced its latest financial results, with the company having plenty to boast about, beating analyst expectations in revenue, and seeing its Surface range move back into profitable territory – helping to underline the fact that Microsoft isn’t going to kill off the hybrids (as a previous rumor speculated). The headline figures were a total first quarter revenue of $24.5 billion (around £18.7 billion, AU$32 billion) which was up 12% year-on-year, and a net income of $6.6 billion (around £5 billion, AU$8.6 billion) which represented an increase of 16% compared to the previous year. When it came to Surface device sales, Microsoft said that revenue had increased by 12%, and that this had been ‘driven’ by folks buying the Surface Laptop. As we’ve discussed previously, Surface revenue has been down of late, dropping 2% (year-on-year) in the last fiscal quarter, and plunging 26% in the quarter before that – which partly sparked all the talk about discontinuing the range. So Microsoft will doubtless be relieved to see some healthy growth this time around. The company had already asserted that any talk of killing off Surface is merely a ‘tabloid rumor’ which is far from the truth. 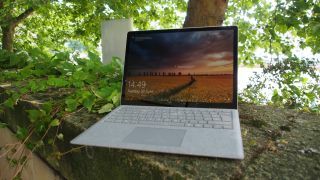 We certainly wouldn’t want to see anything happen to these convertibles, as we were highly impressed by the latest Surface Pro launched earlier this year (and there’s an LTE variant to come before the year is out). Office consumer products and cloud revenue was up 12% on the previous year, and Microsoft further noted that the number of Office 365 consumer subscribers has now hit 28 million.